Nicholas Walters has caused controversy when he quit after the seventh round in his highly anticipated fight with Vasyl Lomachenko on Saturday night. He didn’t look to be in any kind of definite trouble although it was looking like the Ukrainian was in control of the bout. Thankfully, controversial corner retirements although general controversial retirements are much more common. This article is going to look at 5 of the most shocking and unexpected ring retirements in boxing history! Not yet known as the world famous ‘Muhammad Ali’, Clay’s blood pressure was recorded to be so high at the weigh-in that he was almost universally thought to be petrified of the reigning champion Sonny Liston. During the fight, however, Clay controlled Liston mainly with his dazzling footwork and blistering jab while managing to move out of the way of the champion’s more powerful shots with his upper body movement. Clay was odds against winning the heavyweight crown but Liston called it a day after the 6th round citing a shoulder injury. 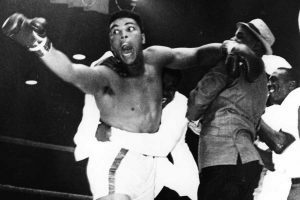 More controversy reared its head in the rematch when Liston was stopped in the first round, although it is widely agreed that nothing of note had landed by Ali. You can decide on that one. 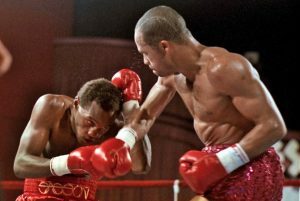 You would be forgiven if you thought that the number 6 had any degree of notorious significance in boxing because Don Curry, then pound for pound number 1 welterweight boxer during the 1980’s, would be halted after the sixth against British challenger Lloyd Honeyghan. Despite the majority opinion predicting that Honeyghan would virtually have no chance, Curry retired at the end of the sixth after developing a cut over his eye and struggled with his opponent’s smooth running style, effectively giving up his world crown. 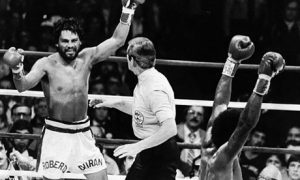 Is Duran’s decision to quit against Leonard in their 1980 rematch the most famous ring evacuation in history? It wouldn’t be out of the question! After upsetting glamorous media darling Leonard 5 months earlier on points, Duran would go on to confess that he celebrated his win just a little too much in order to be fully prepared for their second meeting after eating and drinking with family and friends and could not get in peak shape. The result was a verbal abandonment in the eighth round when he told the referee he no longer wanted to continue. 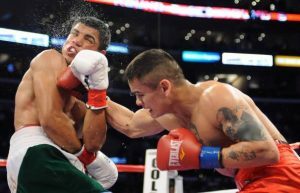 Victor Ortiz racked up 25 wins in 26 fights up until he faced the hard hitting Marcos Maidana from Argentina. It is a little puzzling as to why Golden Boy Promotions would throw their supposedly future star in with such a dangerous opponent the way they did, but if there is one thing that it told was that it gave audiences some insight into how much Ortiz desired a win when the going went tough. Ortiz started off well, knocking down Maidana in the first and second rounds although he hit the deck himself in the first and sixth. After the second knockdown, to the shock of many, Ortiz waved his gloved hand at the referee and said that he wanted no more. Ortiz would go on to partially redeem himself when he rested the WBC crown from Andre Berto but raised doubts again in his bouts with the likes of Floyd Mayweather and Andre Berto in their rematch. 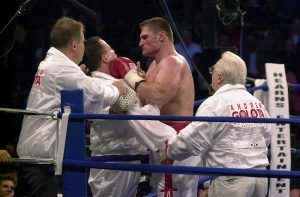 Polish Andrew Golota may have lost some of that fearsome reputation that he gained after giving Riddick Bowe two tough bruising fights, but his fight with Mike Tyson was predicted to be a situation where fireworks were bound to spark at any given point! But Golota would go on to tell the 3rd man in the ring that he wanted no more when he quit after the 3rd round. It was later found out that Golota had multiple fractures, so perhaps this was a case where a fighter made a jutifiable decision. As a sidenote, the bout would go on to be declared as a No Contest after it was discovered that Tyson had marijuana in his system.